Mrs. Annie Mae Clavon James, widow of the late Nathan James, Jr. departed this earthly life on Sunday, September 9, 2018 at her home in Myrtle Beach, South Carolina. 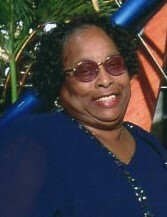 Born in Lee County on July 1, 1932, she was a daughter of the late Dock Clavon Sr. and the late Sarah Williams Clavon. Mrs. James was educated in the public schools in Sumter County. At an early age, she joined Galilee Baptist Church in Mayesville, South Carolina where she served faithfully until she married and relocated to Mullins, South Carolina. Mrs. James has cared for and blessed many with her love and kindness. She provided a safe, loving and welcoming home to her family and anyone in need at all times. Her concern for family, friends and church was exhibited through so many ways especially her smile and laughter. In addition to her husband and parents, she was preceded in death by her son, Elmore James Sr., two brothers: Dock Clavon Jr. and Cryous Clavon; three sisters: Wilber Davis, Ollie McLeod and Sarah Blyther. She leaves to cherish precious memories: one daughter, Annie Clavon Gilchrist (Johnny) of Myrtle Beach, SC, a host of grandchildren and great grandchildren, two sisters: Mary Ann Green and Betty Dwyer of Sumter, SC, three sisters-in-laws: Emma Jean Reid, Elizabeth James, Iola Scott, along with many loving nieces, nephews and other relatives and friends.